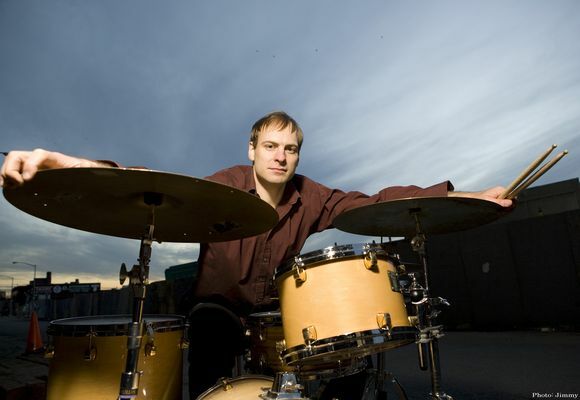 As a drummer, Ari Hoenig's success has been unprecedented. Growing up in Philadelphia, his parent's influence exposed Ari to a variety of alternative musical experiences. His father is a conductor and classical singer, his mother a violinist and pianist. Accordingly, at six years of age, Ari began studying the violin and piano. He began playing drums at age twelve and by age fourteen, he was honing his skills with other young jazz musicians at Philly clubs such as Ortlieb's Jazz Haus. Shortly thereafter, Ari moved into Brooklyn, and since, has found himself playing extensively with variety of groups, including Jean Michel Pilc Trio, Kenny Werner Trio, Chris Potter Underground, Kurt Rosenwinkel Group, Joshua Redman Elastic band, Jazz Mandolin Project and bands led by Wayne Krantz, Mike Stern, Richard Bona, Pat Martino, Dave Leibman, and Bojan Z. He has also shared the stage with such artists as Herbie Hancock, Ivan Linz, Wynton Marsalis, Toots Theilmans, Dave Holland, Joe Lovano, Pat Metheny, and Gerry Mulligan. Both records received rave reviews and Fanfare Magazine listed "The Painter" as one of the top 5 records of 2004. Interviews and articles featuring Ari himself have appeared in numerous publications, including Jazz Times, Modern Drummer, Jazzman, Bateria, Citizen Jazz, Philadelphia City Paper, All About Jazz, Philadelphia Weekly, Rim Shot, Drummer, Jazziz, Relix and Downbeat, which included Ari in the article "13 Drummers for the Future." Ari's quartet was filmed live at Fat Cat by Arte (French) television as part of a concert series "Jazz in New York." They appeared on the show "After Hours" on MSNBC and toured extensively worldwide, drawing strong audiences and critical acclaim wherever they played. In 2006 Ari signed a multi record deal with Dreyfus Records and released his first record for them, "Inversations." Inversations features Jean Michel Pilc, Johannes Weidenmueller. The fall of 2006 kicked off a long CD release tour, taking the group through Spain, Italy, and Finland, as well as various cities in the U.S. Currently Ari leads two bands which both play his original music. Ari's Quartet, a.k.a. "Punk Bop," features Will Vinson on alto, Jonathan Kreisberg or Gilad Hekselman on guitar, and Matt Penman on bass. Ari looks forward to his next Dreyfus release on which "Punk Bop" will be joined by Chris Potter on tenor. Ari's other group is a trio that he co-leads with longtime partner pianist Jean Michel Pilc. After playing in each other's trios for some time, Ari and Jean Michel formed the Hoenig Pilc Project in 2006 to meld their two trios into a single, uniquely bold musical statement. Ari plays often with these two groups at his regular Monday night gig at Smalls in the Village. He also uses this gig to present other side projects and experiments he is working on at the time. Both of Ari's self-produced solo drum CDs, "Time Travels" (2000) and "The Life Of A Day" (2002), document his exploratory nature. They represent an ambitious tribute to the melodic possibilities of the drum set. Ari continues to build on the concepts of these two records by playing largely improvised solo concerts using a regular four piece drum kit and no percussion. In January and Febuary of 2007, Ari played solo drum concerts in the Opera House in Leon France; in New York City's 55 Bar; and for a live broadcast on Philadelphia radio station WRTI. Ari is also a composer, arranger, and pianist/keyboardist. His compositions and arrangements are included in the repertoires and recordings of Kenny Werner, Jean Michel Pilc, Jazz Mandolin Project, the R & B band "Good Results," and Bojan Z's group. In 2005, in affiliation with the National Endowment for the Arts, Ari was awarded a "Meet the Composer" grant to perform his compositions with his own group. As an educator, Ari teaches privatly at the New School for Social Research in New York. He gives clinics and lectures at music schools and universities worldwide, and writes a regular educational column for Modern Drummer magazine. In collaboration with bassist Johannes Weidenmueller, Ari has finished a book on metric modulations due out in 2007(Mel Bay Publishing).